Update, 12:35 p.m. Friday, Nov. 21: A private collector from Marblehead, Mass., purchased the document bearing Jefferson’s signature after bidding $32,500 via telephone. Once upon a time, the U.S. House and Senate were able to take momentous steps — agreeing, for example, to admit Vermont to the Union as the 14th state on March 4, 1791. Now, a contemporary Vermonter has an opportunity to acquire firsthand proof of that historic instance of congressional comity by bidding on a document to be auctioned off in Manhattan on November 20. Titled "An Act for the Admission of the State of Vermont into this Union," the congressional declaration was signed by Thomas Jefferson, who at the time was U.S. secretary of state. The dealer offering this one-page print estimates that it will fetch between $15,000 and $25,000. That's the highest anticipated price among seven Vermont-related documents that Swann Auction Galleries is putting on the block Thursday. Each piece of Vermontiana comes from the collection of Milton R. Slater, a resident of Sleepy Hollow, N.Y., who died earlier this year at age 96. Swann describes Slater as "omnivorous in his tastes" and the owner of a "massive collection" that tended toward Americana, literature and books about books. Swann specializes in rare books and "works on paper" including autographs, maps and prints. The sixth-floor gallery on E. 25th Street in the Flatiron District resembles a small library, but with more items displayed on the walls than on shelves. In addition to framed letters signed by several U.S. presidents, Swann's public area includes a glass cabinet containing original editions of major literary works such as The Grapes of Wrath, Ulysses, Leaves of Grass and The Adventures of Mickey Mouse. The five-figure estimate for the Jefferson sheet reflects prices for similar documents at other auctions as well as its "interesting and unusual" status, says Marco Tomaschett, a specialist in Swann's autographs department. It's one of 28 signed copies of the declaration of Vermont statehood. At the time, the U.S. government sent each governor of the 14 states, including Vermont, two copies of the act that states: "... it is hereby enacted and declared, That on the fourth day of March, one thousand seven hundred and ninety-one, the said state, by the name and stile of 'the State of Vermont,' shall be received and admitted into this Union, as a new and entire member of the United States of America." The Vermont Historical Society has one copy of the Jefferson declaration, but librarian Paul Carnahan says that it was obtained in the 19th century from a dealer in Philadelphia, so it is probably not one of the two sent to Vermont in 1791. The state archives has a photocopy of one of the originals. "This is certainly a very interesting and important document," says Sydney Stokes, chairman of the Ripton-based Jefferson Legacy Foundation. He points out that Jefferson had a personal connection to Vermont. The future president of the United States traveled to the state, along with another future U.S. head of state, James Madison, on a three-day "botanizing excursion" a couple of months after Vermont's official admission to the union. Stokes' foundation, established in 1993, is dedicated to "celebrating, applying and raising awareness of Thomas Jefferson's living legacy in a modern world," according to its website. The document up for bid is fully legible but has some brown stains, especially along the right edge. Such leaching is the product of its placement "at some point near or under another document that had acid content," says Tomaschett. A letter signed by Ira Allen — brother of Ethan Allen — dated July 4, 1806, is also among the noteworthy items for sale. Tomaschett estimates it will fetch between $2,000 and $3,000. 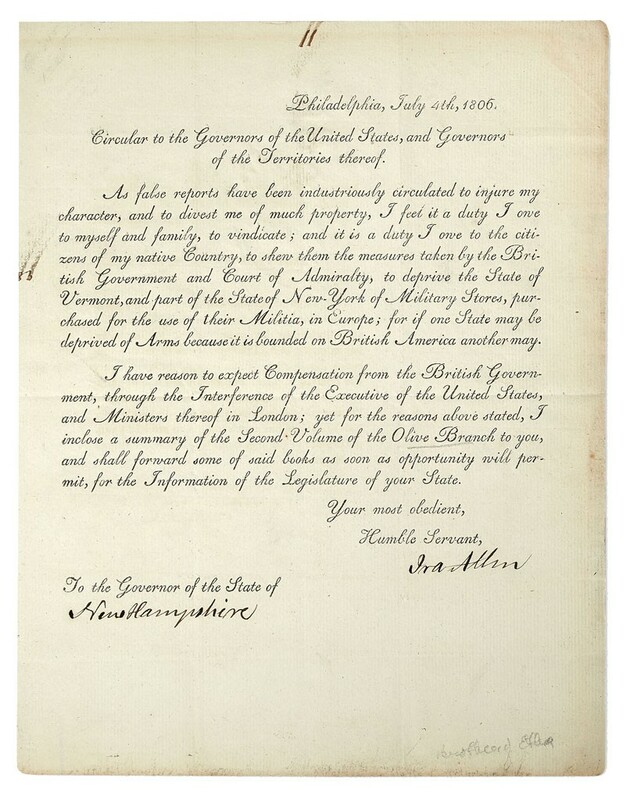 In the printed letter addressed to the governor of New Hampshire, Allen seeks to correct "false reports" that "have been industriously circulated to injure my character, and to divest me of much property." The founder of the University of Vermont was basing his complaint on the British admiralty's seizure eight years earlier of 15,000 muskets from France being transported by Allen's ship, Olive Branch, for use by the militias of Vermont and New York. Allen adds that he is seeking to clarify those circumstances due to his concern that "if one State may be deprived of Arms because it is bounded on British America another may." 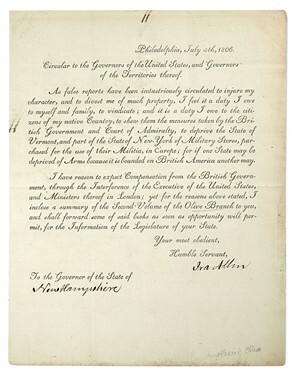 Documents signed by Ira Allen are not often auctioned, Tomaschett notes. The significance of this letter is heightened "by the fact that not many people recognize" this Allen brother. "Everyone knows Ethan Allen," Tomaschett says. Swann is also offering a deed signed by Ethan Allen for the sale of 450 acres in the Vermont township of Georgia. Cosigned by Ethan's brother Levi, the document, dated August 18, 1774, states that the land is being transferred to Israel Dickinson of Pittsfield. Ethan and Levi received 10 British pounds for the property — considerably less than the sum for which the deed is expected to sell later this week: between $3,000 and $4,000. A successful bidder for another item among Swann's Vermont documents will be able to boast that he or she has obtained an original "John Hancock." That famously florid signature is affixed — twice — to a letter Hancock signed in October and November 1779 in his capacity as speaker of the Massachusetts Council. Hancock was acknowledging the processing by the Massachusetts legislative body of an act passed by the Continental Congress concerning resolution of boundary disputes among New York, New Hampshire and Massachusetts. Two years earlier, the residents of the region described as the New Hampshire Grants had declared themselves denizens of the independent Republic of Vermont. Because the neighboring states did not recognize the Republic of Vermont, the Continental Congress intervened to settle the border disputes alluded to in Hancock's letter. The Hancock document carries the second-highest sales estimate — $8,000 to $12,000 — among the pieces in Swann's Vermont lot. The lowest — $200 to $300 — is projected for a document signed by Thomas Chittenden, who would become the first governor of Vermont. It grants a tract of land near the towns of Landgrove, Londonderry and Winhall to Edward Aikins and associates. Dated February 25, 1782, the document is in comparatively poor condition, with several holes and some staining from dampness. Also going on the block is a January 14, 1790, letter from New York City Mayor Richard Varick declining his appointment to a commission adjusting boundaries between Vermont and New York State. Varick notes in his communication to the New York Assembly speaker that the appointment had been "without my knowledge or wish." The letter is expected to bring between $800 and $1,200. Swann offers a slightly higher estimate — $1,000 to $1,200 — for a November 16, 1808, letter signed by then-secretary of state John Quincy Adams. It notifies the editors of the Vermont Republican in Windsor that their newspaper has been "selected as one among the number designated for publishing the Acts, Resolutions, Treaties, &c. which may be approved and ratified during the Second Session of the Fifteenth Congress." Who buys such stuff? Collectors of Americana, of which there are many, Tomaschett says. He expects bidders "from all over the world" to participate in the November 20 auction. Vermont history buffs interested in placing bids on any of these documents will find assistance available from Swann, Tomaschett says. The auction house "does go out of its way to make it easy for first-timers," he notes. Absentee bids can be made online or by phone, with potential buyers stating the maximum amount they are willing to pay. Advises Tomaschett: "That's the way most newcomers should bid." The original print version of this article was headlined "Ye Olde Vermont Papers for Sale — and Not for a Few Pounds"